All ISIDORE semantic enrichments as well as harvested metadata are available in RDF and can be queried in SPARQL thanks to this SPARQL endpoint. A SPARQL endpoint is a web interface that allows you to query digital information structured in RDF (Resource Description Framework). The query is done using SPARQL, a standardized and open language developed and maintained by the W3C. What do we access with the SPARQL endpoint of ISIDORE? 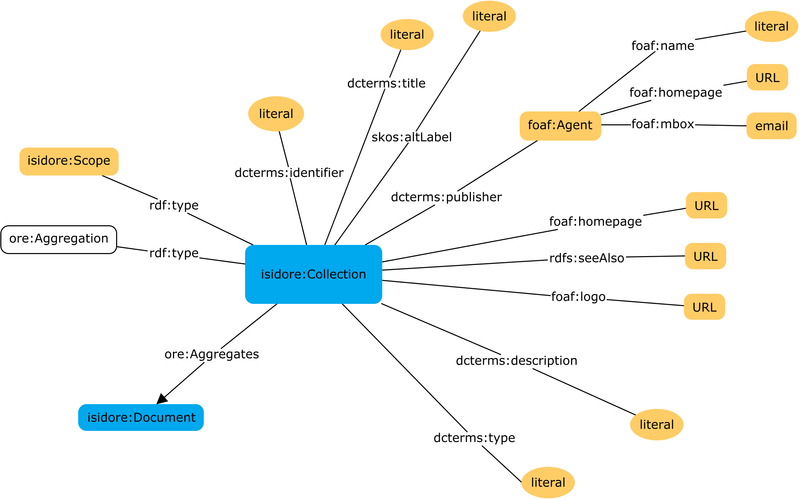 The SPARQL endpoint of ISIDORE provides a way to query all metadata harvested, structured and enriched by ISIDORE, i.e. the content accessible through the website isidore.science. The harvested metadata are enriched by semantic processing through scientific vocabularies (thesauri, lists of authorities, vocabularies). All enrichments are currently accessible via the SPARQL endpoint. With RDF and SPARQL, it is possible to query the structured information within metadata without having a lowest common denominator. Since there are many data repositories structured according to the RDF model, it is mainly possible to create web or mobile applications with RDF data linked together by URIs. These URIs usually have the form of URLs, i.e. web addresses. This is the principle of linked data. 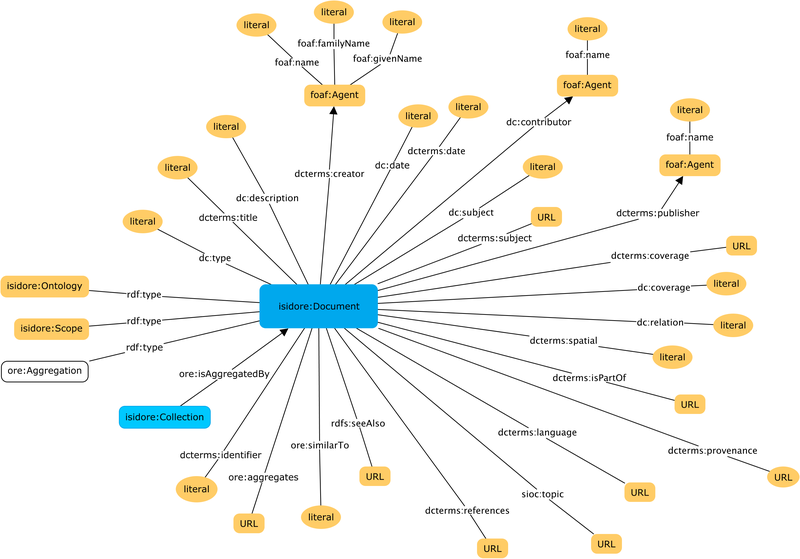 Developed by the W3C as part of the Semantic Web activities, RDF is not strictly speaking a metadata schema. It is a model for describing structured data based on first-order predicate logic and graph theory. Its genericity and flexibility provide an interoperable framework for describing all types of resources in a networked environment such as the Web. RDF is a model that allows you to express assertions according to a very simple model similar to a simple sentence: [subject][predicate][object]. Each assertion is a triplet whose different components are expressed as a URI. The advantage of RDF is that it is possible to use RDF triplets without conversion, regardless of the vocabulary used, unlike XML, where it is necessary to convert data if they do not use the same schema. Thus, it does not require different producers to agree on a metadata structure, as is the case in the OAI-PMH protocol with the OAI_DC (Dublin Core simple) application profile, or to be limited to a lower common denominator to ensure interoperability. 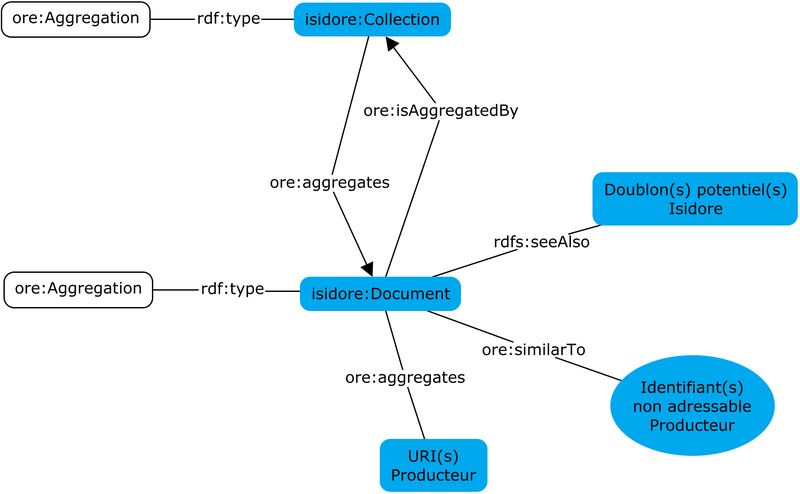 In ISIDORE, all data expressed in XML coming from an OAI-PMH repository or syndication feeds (RSS 1 and 2, Atom) are converted to RDF at the end of processing. Data natively expressed in RDF through encoding with RDFa syntax are retrieved directly from web pages after undergoing similar processing. After this conversion, data are exposed and producers and users can retrieve them in their own environment and reprocess them. All data are stored in a RDF database (or RDF triple store) and the SPARQL endpoint can be used to query data. This SPARQL endpoint has been produced by the “data interoperability” team of the Very Large Research Infrastructure Huma-Num from CNRS as part of the ISIDORE platform. POUYLLAU, S., MINEL, J-L., CAPELLI, L., ISIDORE : Présentation générale du projet, Univ. d'hiver du TGE Adonis, Valpré. December 2010. POUPEAU, G., ISIDORE et le web de données, Univ. d'hiver du TGE Adonis, Valpré. December 2010.